The Canada Series of geocoins will celebrate the 10 provinces and 3 territories that make up our great country in this our 150th year of confederation. 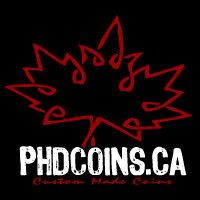 Each coin in the series will fit together to form a map of Canada. Nova Scotia geocachers Beaver Pelt and hirtle are the brains behind this huge project. They approached me a year ago, and after being sworn to secrecy I began work on the difficult design. Now, finally, I am able to break the silence and announce the Canada Series.